When asked why she chose to write about food and hunger, prolific writer M.F.K. Fisher replied, "When I write about hunger, I am really writing about love and the hunger for it, and warmth, and the love of it...and then the warmth and richness and fine reality of hunger satisfied." Such a beautiful, simple, elegantly stated answer to a complex question. And that in a nutshell is what Mary Francis Kennedy Fisher was all about. But my foray into Fisher's writing didn't start with her. It started instead with Judith Jones, cookbook publisher extraordinaire; the woman who finally brought "Mastering the Art of French Cooking" into fruition, and with it catapulted Juila Child into stardom. She also, incidentally, was the person responsible for getting "The Diary of Anne Frank" published here in the United States. Jones's own memoir, "The Tenth Muse," is one of my most cherished books, and in it she talks briefly, but reverently, of M.F.K. Fisher. Not really knowing Fisher (I vaguely remembered hearing about her somewhere before), I was struck how she kept popping up in the subsequent memoirs I read from other famous chefs and restaurant critics. Who was this writer? I wondered. 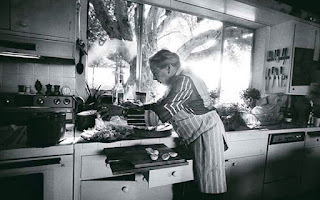 Why did people in the food world speak about her so reverently? Why was she so important? I was determined this summer to find out, delving into the huge tome "The Art of Eating." This compilation of five of Fisher's most loved works (Serve It Forth, Consider the Oyster, How to Cook A Wolf, The Gastronomical Me, An Alphabet For Gourmets) shows off the créme de la créme of her genius. Although I've only gotten through three of them, it was more than enough to help me understand why Fisher is so revered. She is one of the most brilliant food writers I've ever read. Scratch that. She's one of the most brilliant writers I've read, ever. So what's so fantastic about her writing? How very uncomplicated it is, and yet how sensuous, witty, clever, and genuine it is all at the same time. Take her sublime "Serve It Forth" for instance. She effortlessly weaves a tapestry of the history of gourmet food and its evolution with memories of her culinary pursuits while living in Dijon, France. I learned so much, felt so much hunger, and even laughed aloud a few times. I was never once bored or itched to get to the next essay. I found myself lapping it up, and exclaiming tidbits to my husband - for instance, did you know that French cuisine, which is regarded around the globe as the finest cuisine, got its humbled beginnings not from French chefs, but Italians? In 1533 Pope Clement VII married his niece Catherine de Medici to Henry II, and she brought her Florentine cooks with her to Paris. Their innovations in her kitchen ignited a fire and lust for good food in France that has continued to this day. Fisher in the kitchen, doing what she loved best. "Mary Frances has the extraordinary ability to make the ordinary seem rich and wonderful. Her dignity comes from her absolute insistence on appreciating life as it comes to her. You'll see." "The Art of Eating" is a good place to start, but if you want to take smaller bites, you can purchase her books individually (Amazon.com is a good place to look) for a small price. If you love reading about food, there is no finer food writer than Fisher. As Reichl says, "I can't tell you how much I envy you the joy of reading Mary Frances for the first time. It will change your life."